Swatches: Glittering Elements Mystery Box - Party Like it's 1999! 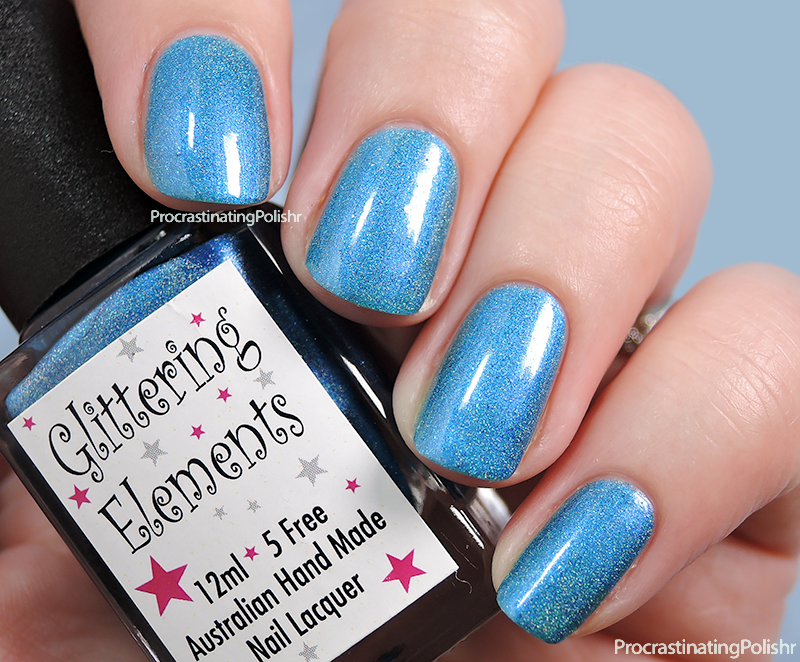 Today I have some swatches of the June Glittering Elements mystery box that I've had sitting on my nail desk staring out at me for weeks begging for attention. Casey has been releasing monthly mystery boxes and this is the second one I've bought and loved - there's always a subtle beauty or unique element to her creations that make it worth the risk of getting a colour I don't like. The June box did include a pink, but the other two are so beautiful I don't even care! 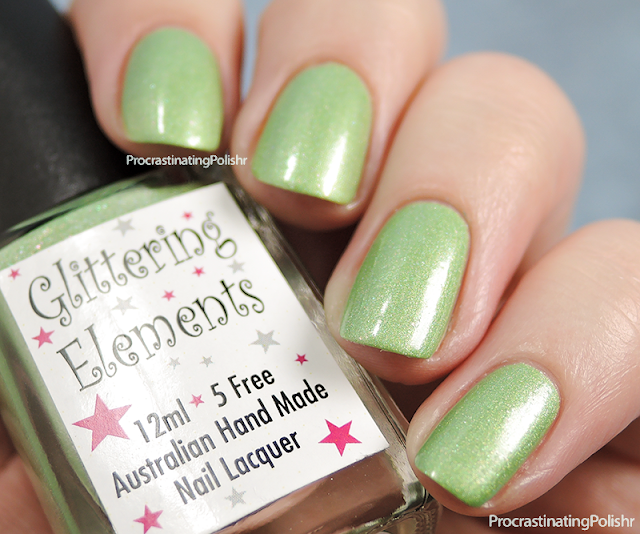 This delicious apple green is a beautiful soft holo with a golden shine and scattered flakes. Photos are taken in a lightbox so the holo effect is dulled out, but it's actually quite lovely in real life. I used three coats for my swatches but it was almost opaque enough after two thin coats, certainly enough for everyday wear. 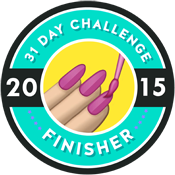 I didn't use any top coat for this swatch and it dried down nice and smooth. The formula was wonderful as I've come to expect with Glittering Elements. I absolutely adore the colour and was head over heels finding this in the box! It's soft but warm and it feels like a colour I don't see a lot of. A glorious cerulean blue, with a similar finish and formula to Hang Over Cure. 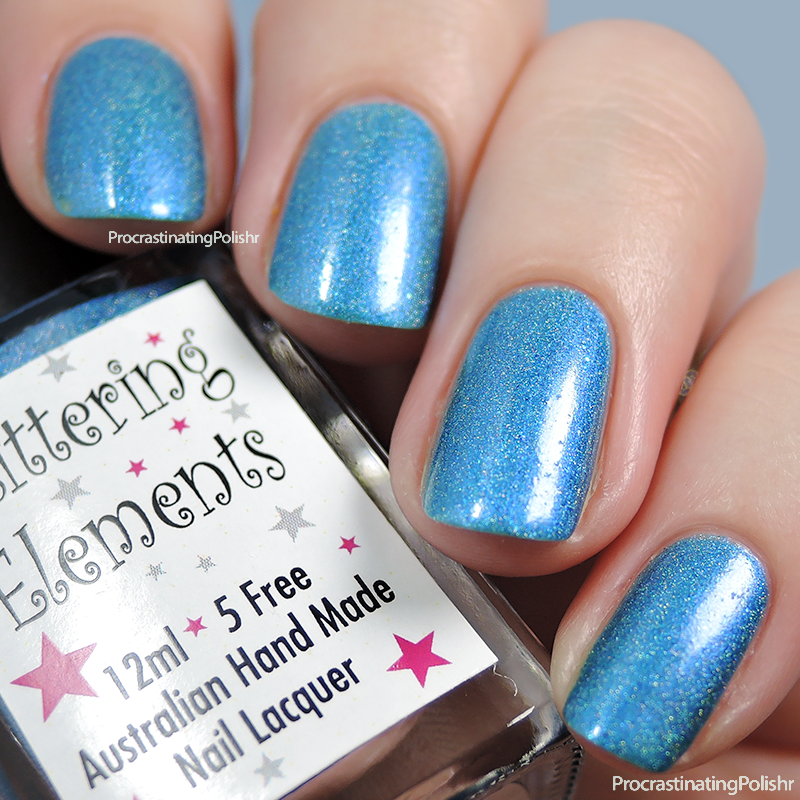 There's generous holo rainbows, subtle flakes and a slight pink shimmer. 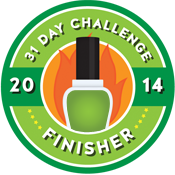 I only needed two coats for perfect coverage and no top coat as it dried quite quickly on it's own. Greens and blues are far and away my favourite colours and I particularly love this deep sky blue. So dreamy and vivid! I mentioned there was a pink and damn if this isn't the pinkest! It's all bubblegum and fairy floss and glitter. Despite all of this fluff I actually don't mind this shade! Would I rush to wear it again? Probably not. But would I recommend it to someone with kinder feelings towards pink? Absolutely. I haven't seen many holo polishes integrate glitters quite as well as this one does. 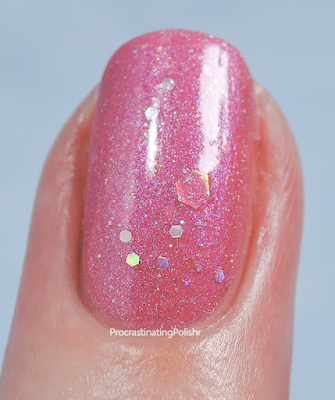 So many holos are quite thin and glitters end up sitting on top, but Party Tricks is slightly creamier and the glitter sits as it would in a crelly type polish. I finished off with a good layer of top coat which brought out a hint of purple shimmer I hadn't previously noticed. Very pretty. If you're game for a surprise I'd definitely check out the next mystery box released - orders for a Sailor Moon themed box recently closed but there should be a new pre-order open for the August box soon! 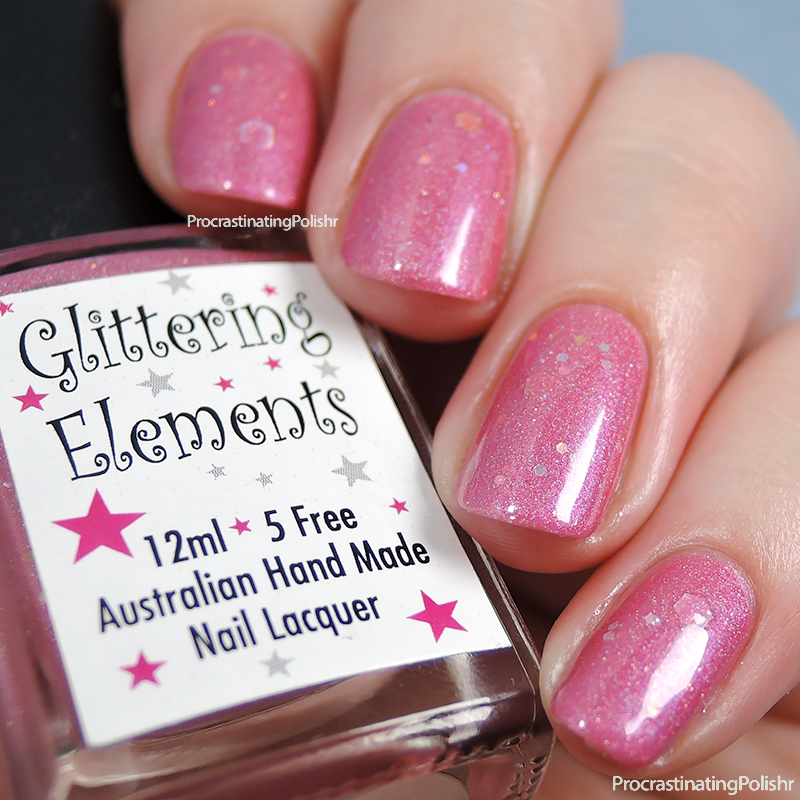 You can find Glittering Elements on Etsy, and join the official Facebook group for updates. What do you think? 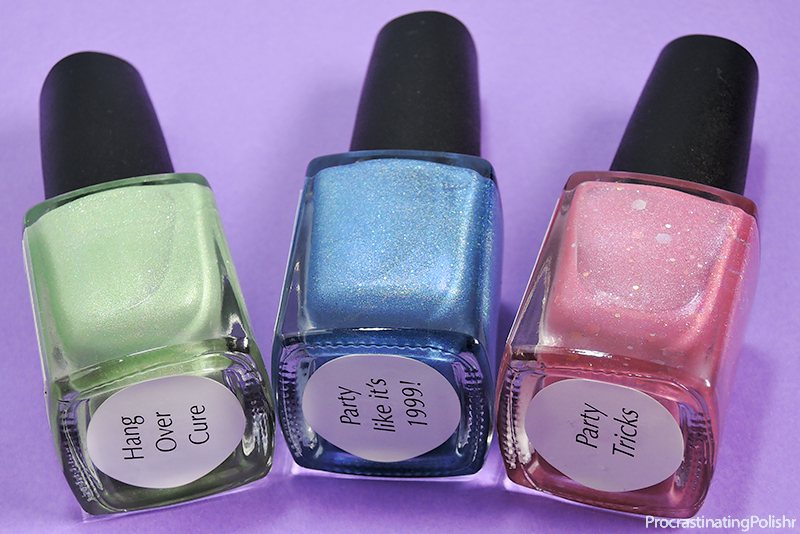 Do you like the surprise element of mystery polish or do you only hand over your hard earned dollars for something you know you like?